B&P Littleford manufactures high speed PVC mixers in a variety of sizes with customizable parts, perfectly tailored to our clients' needs. Intregral to the blending system, our mixing systems allow for high productivity with PVC compounding, mixing and more. Historically, plasticizers have been used to change hard PVC resins into flexible products with the desired softness. The mechanism involves the neutralization, by plasticizer molecules, of the van der Waals forces between the polymer chains. 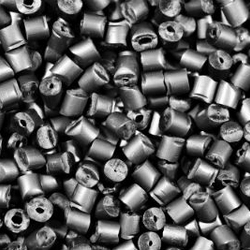 Depending on the degree of softness required, the amount of plasticizer added (parts per hundred of resin) can vary from approximately 20-120 parts. In order to permit ease of material handling and further processing, the plasticizer must be completely absorbed by the PVC resin, producing a dry, free flowing, powder - hence the name “dry blend”. This is achieved by heating the resin to a temperature of approximately 200°F, causing the resin to expand and then absorb the added plasticizers. 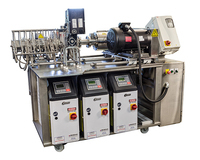 For highly plasticized blends, normally above 50 PHR, the additional parameter of time is needed to assure a dry blend. 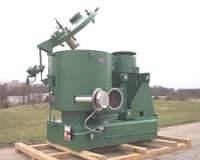 Since PVC dry blends are usually followed by “fluxing” devices, such as a banbury or pelletizing extruder, there is no need for an intense premix dispersion as would be obtained in a B&P Littleford high intensity mixer. Moreover, since cycle times are short in the intensive mixer, there is frequently not sufficient time for thorough plasticizer absorption in highly plasticized blends. These highly plasticized “dry blends” have normally been prepared in large, slow moving, jacketed ribbon blenders where the initial dispersion and plasticizer absorption take place. The mixed and tempered blends are then fed directly to a banbury mixer, pelletizing extruder, or are cooled and stored for further processing. While ribbon blenders have been used in this application for a number of years, they were found to be inefficient mixing and heat transfer devices. Cycle times were frequently in the neighborhood of 45-60 minutes. Also, if color corrections were necessary, an additional 15-20 minutes was needed to insure a fair-good dispersion. B&P Littleford's process technology and mixer design present a totally new concept of PVC dry blend preparation that has proven to be superior to existing ribbon blender processes. The unique mix action developed in the B&P Littleford “intermediate intensity” mixer insures a rapid and complete dispersion of all ingredients and effective heat transfer. The mix action is developed by the turning of plow-shaped mixing tools at a speed sufficient to cause the materials of mix to become a pulsating, “mechanically fluidized” bed. This permits an individualization of particles that not only results in rapid and precise mixing, but exposes tremendous particle surface area for exceptionally fast heat transfer. If necessary, the mixer can be equipped with high speed chopping devices for added de-agglomeration and dispersion of minor ingredients. The mixing cycle in a B&P Littleford mixer, depending on the materials of mix (parts plasticizer, etc.) is in the range of 15-20 minutes. Color corrections to the batch, of necessary, can be made in a couple of minutes. The B&P Littleford mixer, being a horizontal cylinder, eliminates a wet band buildup problem that often occurs on the straight sides of a ribbon blender; this buildup may fall into the ribbon blender batch during discharge. The B&P Littleford mixer design has been thoroughly tested in the lab and proven in the field many times. The mixers can be purchased in a variety of sizes to meet most all production requirements. B&P Littleford can also assist in supplying fully automated process systems or the interfacing of mixers with existing equipment. 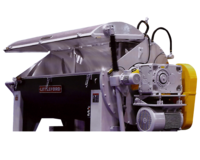 B&P Littleford LM Series High Intensity Mixers are available in 10-2500 liter sizes. B&P Littleford LR Series Coolers are available in 700 to 8000 liter sizes.